ASBO 19 takes place on Friday May 10th. It's a night when we pull out all the stops, with a fun competition to take part in during the day and a spectacular final in the evening. 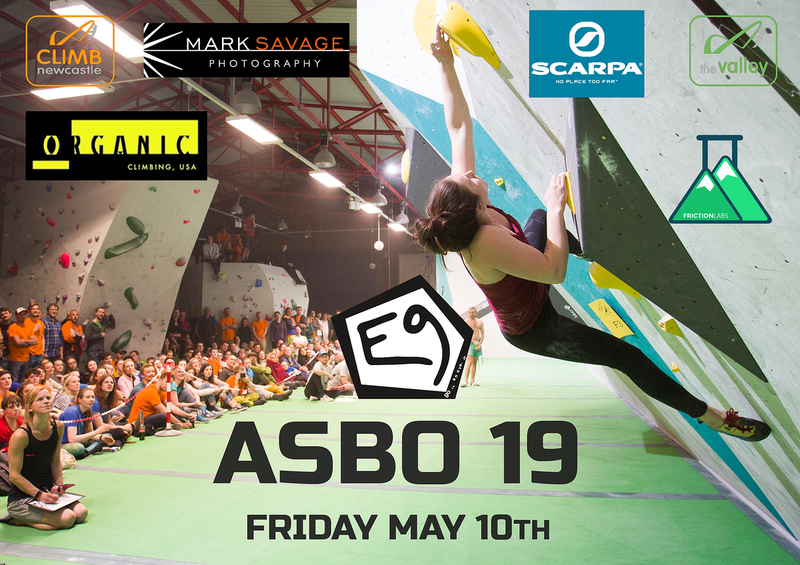 ASBO 19 takes place at The Valley on Friday 10th May 2019, from 12 midday til late. Taking part is free with your normal entry fee! If you don't want to try the climbs then you can also spectate for free! We make a huge loss on the event. We don't mind; the past 9 events have been some of the fondest in Climb Newcastle's history! If you really feel sorry for us then you can by something from the shop, or this year a pizza from the pizza van! And did we mention free ASBO t-shirts? For at least the first 200 people in! There are; £500 is at stake for the male and female ASBO champions. Plus prizes from our sponsors. Ask an ASBO champion though and they'll tell you it isn't about the money. There is nothing quite like the atmosphee of an ASBO final and moving up to Valley proportions it is going to be very special indeed. Think about your travel arrangements... it is going to be extraordinarily busy. We recommend public transport if you can, and if not think about parking and walking in from Byker centre, Ouseburn or The Pool. We also have tons of internal bike parking. The ASBO finals are always great to watch. The top 4 male and female competitors will battle it out in a spectacular finale, each taking turns to take on the imagination of our route-setting team. Spectating is free; if you want to climb before, just pay your normal entry. Our international team of in-house route-setters will be on hand to set the competition problems. Setting starts early in the week with the finals set and tested on the Wednesday (before being marked and stripped). ￼￼The testing team, of Chris, Suzan and Andy Porter make sure that the problems are vaguely sensible and possibly climbable! Then the finals come down and the qualifiers ho up. Once the qualifying is finished you will see the setting team, plus helpers, take down the qualifying problems and put up the finals. Remember they’ve tested these *cough* thoroughly, they aren’t just making it up as they go along! The list of ASBO winners reads like a who's who of UK climbing. Expect to see some of these guys on May 11th!